Theodor Seuss Geisel (pronounced /ˈsɔɪs ˈɡaɪzəl/; March 2, 1904 – September 24, 1991) was an American writer and cartoonist from Springfield, Massachusetts. He was better known by his pen name, Dr. Seuss. He pronounced his name English pronunciation: /ˈsɔɪs/, but it is often said as English pronunciation: /ˈsuːs/. In his long life Geisel wrote more than 60 books. Though most of them were published as Dr. Seuss, he also wrote 13 books as Theo. LeSieg and one as Rosetta Stone (a pun on the Rosetta Stone). Theodor Seuss Geisel is one of the most popular children's authors of all time. His books have sold over 222 million copies and been translated into more than 15 languages. In the years after his death in 1991, several books have been published based on his sketches and notes; these include Hooray for Diffendoofer Day! and Daisy-Head Mayzie. Though they were all published under the name Dr. Seuss, only My Many Colored Days, originally written in 1973, was entirely by Geisel. 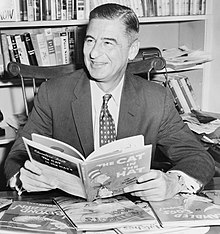 Dr. Seuss died from oral cancer in La Jolla, California, aged 87. ↑ "Seussville: Biography". Dr. Seuss Enterprises, L.P. Retrieved 2008-08-11. Theodor Seuss Geisel: The Early Works, Volume 1 (Checker Book Publishing, 2005; ISBN 1-933160-01-2), Early Works Volume 1 is the first of a series collecting various political cartoons, advertisements, and various images drawn by Geisel long before he had written any of his world-famous books. The Secret Art of Dr. Seuss by Audrey Geisel (New York: Random House, 1995; ISBN 0-679-43448-8) contains many full-color reproductions of Geisel's private, previously unpublished artwork. Dr. Seuss Goes to War: The World War II Editorial Cartoons of Theodor Seuss Geisel, a selection with commentary by Richard Minnear (New Press, 2001; ISBN 1-56584-704-0). The Seuss, the Whole Seuss and Nothing But the Seuss: A Visual Biography of Theodor Seuss Geisel by Charles Cohen (Random House Books for Young Readers, 2004; ISBN 0-375-82248-8). The Boy on Fairfield Street by Kathleen Krull. It tells about the childhood of Dr. Seuss and shows the sources of many of his inspirations.